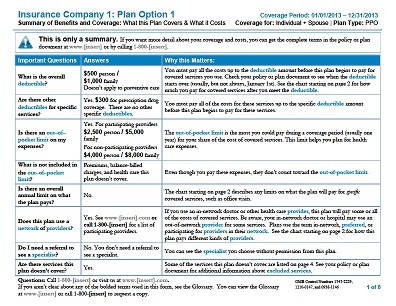 Under its final rule of the Patient Protection and Affordable Care Act, U.S. health insurers and group health plan providers must provide a summary of benefits and coverage (SBC) to participants and beneficiaries who are eligible to enroll or re-enroll in group health coverage through an open enrollment period. The SBC must be distributed on the first day of an open enrollment period that begins on or after September 23, 2012, or on the first day of the plan year on or after September 23, 2012, for special enrollees and those newly eligible for coverage. NOTE: you can access the forms discussed here in the other resources section below. Employers must provide the SBCs within seven (7) business days of a request for information related to a specific plan. The employer has seven (7) business days, starting the day they receive the benefit confirmation to issue an SBC. The employer has seven (7) business days from the date the benefit selection is finalized to distribute to eligible employees and dependents. If renewal benefits are submitted late, eligible employees and dependents must receive SBC no later than the renewal date. When the renewal is automatic and renewal has not been issued at least thirty (30) days prior to the renewal date, then the SBC must be issued within seven(7) business days of the date the benefits were finalized. SBC must be distributed to new hire eligible employees after renewal dates, beginning in or after September 23, 2012. The proposed regulations clarify that if a group health plan or health insurer makes a mid-year material modification to coverage that affects the content of an SBC, the group health plan or health insurer is your must provide a 60-day advance notice to enrollees. However, the 60-day advance notice rule does not apply to modifications made at renewal/annual open enrollment. A “material modification” is the same as a material modification under ERISA Section 102 (any change to the coverage offered that independently or in conjunction with other contemporaneous changes would be considered by the typical plan participant to be an important change, including changes that enhance or reduce benefits, increase premiums or cost-sharing, or impose new referral requirements). The proposed rules require that group health plans and health insurance make a Uniform Glossary of Terms available to participants and beneficiaries. The Uniform Glossary may not be modified and must be provided in paper and electronic form on request by a participant or beneficiary within seven (7) days. (A paper version of the uniform glass right must be available on request). The proposed rules includes a list of health-coverage related terms and medical terms that will need to appear in the Uniform Glossary, which in addition, must include other terms that the Secretary of HHS determines are important to define, so that Individuals and Employers may compare and understand the terms of coverage and medical benefits (including any exceptions to those benefits). Employers that sponsor group health plan should start working with your broker to compile the information necessary to meet the SBC requirements. A group health plan or health insurance insurer that willfully fails to provide an SBC will be subject to a fine of up to $1000 per enrollee who does not receive the SBC. In addition to avoiding some of the changes in small group benefits, some insurers are advising their group clients to “Early renew” and have a new effective date of December 1, 2013, thereby avoiding the more expensive January 1, 0214 changes until later in 2014. If a policy is renewed before January 1, 2014, this allows individuals to effectively postpose the impact of PPACA changes and rating. As a “Trusted Advisor,” we need to take a more strategic look at the Group Employee Benefits package, including plan design, ensuring the right networks of doctors and hospitals, calculating employer contribution, meeting participation requirements, and of course, providing affordable options that fit within the Employer and Employees’ budget. Beginning January 1, 2014, all carriers have had to make changes to their plan portfolio options. For small group, the carriers had to ensure they included the 10 Essential Benefits, including pediatric dental and vision, were meeting a minimum actuarial value of 60%, 70%, 80%, 90%, and were required to significantly change the rating structure, just to name a few. Lock in Q4 pre-community or member-level rated rates. Evaluate if your client has the best, preferred Risk Adjustment Factor (“RAF”) available. The carriers are getting aggressive. Access to current known plan options. Buy more time to evaluate the impact of PPACA, including physician networks and hospitals, community rating/member level rating, and plan designs, as this is ALL changing in 2014. And most IMPORTANT: Be proactive and evaluate your options! RAF .90 – 1.10 No longer available as plans renew on or after January 1, 2014. Member-level rating One rate for family, regardless of age or number of children (based on employee age band) Separate rates for employee, spouse, EACH child 21 or older, and rate for the oldest 3 children under the age of 21. Listed below is a brief summary of how the small group carriers in California are planning on handling early renewals as of May 3, 2013. As you know, things may change, however, we will do our best to keep you informed. Aetna: Employers will have the option of renewing in 2013 to postpose the date they need to comply with ACA. Anthem Blue Cross: will offer small groups the opportunity to purchase a new agreement and adjust their renewal cycle, allowing eligible small group employers to stay on a 2013 benefit plan until later in 2014. Groups accepting this offer would have their medical renewal month adjusted to December 2013 and rates adjusted to correspond with the new renewal cycle. California Choice: Groups with a renewal month of January through November 2013 may change their renewal effective date to December 1, 2013. United HealthCare: For groups renewing January-June 2014, they can request and early effective date. The group will need to complete a UHC Attestation Form and it must be submitted directly to UHC by June 15, 2013. Information above is not a guarantee, and may be subject to change. Please note: Different rules apply to large group (see Transitional Relief for more details).